Recently got a F8P and I was doing research on their diet and found they love snails. and will he eat the mystery snail? Here is a photo of the largest snail. normal for many snail species. 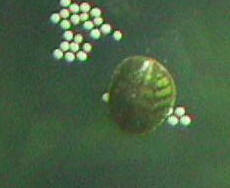 Here is a photo of some of their eggs. along with our fish and they've been in the tank for about three months. I apologize as this is all new to me but I looked into the tank tonight and I noticed what look like tiny snails but they're about the size of pin heads at the moment and I can only count about twenty of them. I'm concerned due to the fact that we've never had snails in our tank and could our fish be in any danger? Again I apologize because I'm not 100% sure of the names. We have two eels, two algae eaters, three neon tetras, three orange tetras, two penguin tetras, one guppy and two platys. I really hope you can help me and should they be a danger to our fish I'd really appreciate some advice on how to deal with them? I believe that I have successfully cycled my aquarium... I unfortunately lost the female platy in the process. I was left with only the male platy...I watched him during the month and decided to get another female (she has been with us for 2 weeks). All the chemistry seems great, I feel that I have gotten beyond all the initial issues. My plan is to bring home a little "blue snail" for clean-up. My question today is: What do I need to consider, for this new community addition? What can you tell me about snails and what water levels should I have to make everyone happy? Thanks again for wonderful insight & knowledge! I have a mystery fish in a 6 1/2 gal separated tank. 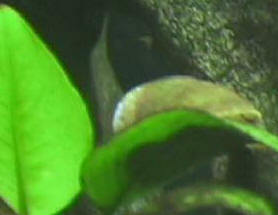 I have a Betta in each separation (three) as well. I have had the set up for about two months. About after the first two weeks, I noticed what seemed to be one small snail offspring which the Betta delightfully used as an early morning meal...shell and all. It was about the size of the top of a pencil eraser. All of a sudden, my parent snails shell is getting what looks like black mold or algae on it. Should I scrape this off or is the a natural process? My environment seems to be good, but after reading some of your articles, I need a heater of some sort. My mom recently bought a snail from Petco. We have no idea what kind of snail it is. She had it for not even a month and this morning looked in the tank and there were two tiny snails. Where did they come from? How did they get their shells? Hello, my name is Julie, and I thank you in advance for any help you may give me. Last week, I brought home some live plants for my new Betta, and ended up a snail mom! I was able to rescue 1 of about 5 that I saw, and put him/her in a separate bowl with water, rocks if he/she wants to get out of the water, ground egg shell, and a fresh supply of peas and broccoli. I change about Â¾ of its water every day. Today, after doing a water change on my Betta, I found another baby snail. I was very excited as I have been constantly checking my Betta tank for more babies. I put the new snail in with AndalÃ© (my first baby snail), and once they found each other, they have been attached, and it almost looks as if the bigger one is trying to yank the smaller ones shell off. Are they fighting? I am very concerned and don't want any harm to come to them. But they are so small that it is very difficult to even make out what is really going on. Also, I was wondering if I can give them human calcium w/ D as a supplement. Oh, as far as a set up for them, they are in a 3 cup bowl with 1 Â½ inches of water. As I mentioned earlier, daily water changes. When they no longer fit in the Betta's mouth, they will go into a 15 gal. tank. Thank you again for your time. Thank you very much for your help. I currently have about 40 tiny babies, and a very happy Betta that gets a constant supply of snail eggs!! Sorry for the trouble but I was re-reading your answer and want to be sure. In one place you say baking soda and in another you say baking powder. Baking powder has (usually) crÃ¨me of tartar in it. Which did you mean?